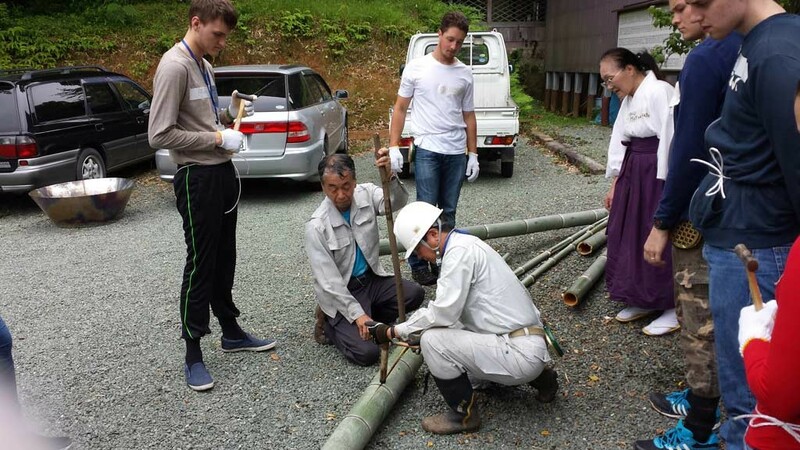 On our second activity day in Omuta/Arao, we went to the Bambooforest to cut bamboo, because it grows really fast here in Japan, and kills the other plants. It was the first time for the WCI doing this. from the 75 years old priest of the shrine. She wished us good health and that we went without any accidents throughout the day. After that, we split into two groups, one for cutting weeds and bamboo, the other one for the kitchen. They prepared the sllide for the Nagashi Somen noodles and the rest for lunch. The bamboo-cutting-team made many things from bamboo, like beerglasses or cups, bracelets and plates, and chopsticks. The kitchen team cut big bamboos in half and prepared them so that they could be used as a slide. Eating Somen out of this silde wasn’t as difficult as we expected. After Lunch, we had a lesson about the Japanese forests and the role of the bamboo in them. We also learned that bamboo is a really supermaterial, because it’s waterproof, antibacterial, and doesn’t break, so you can use it for everything. It was a really fun day, but also really exhausting. Previous PostWCJ 2015, Session 1, Johannes’s Video BlogNext PostCoal mining and Katanas in Omuta and Arao!